HEXUS readers warmly welcomed a pair of new chassis designs from Cryorig at Computex last year. Particular fondness was shown to one ITX chassis dubbed the Taku. Now, instead of just making the damn thing and selling it already, Cryorig has taken to Kickstarter to shoot for $100,000 backing for its Taku ITX chassis project. To recap, the Cryorig Taku is both a stylish monitor stand and a 'high-end' PC case. It looks like a mini curved ply coffee table with a PC inside, with minimal distractions. 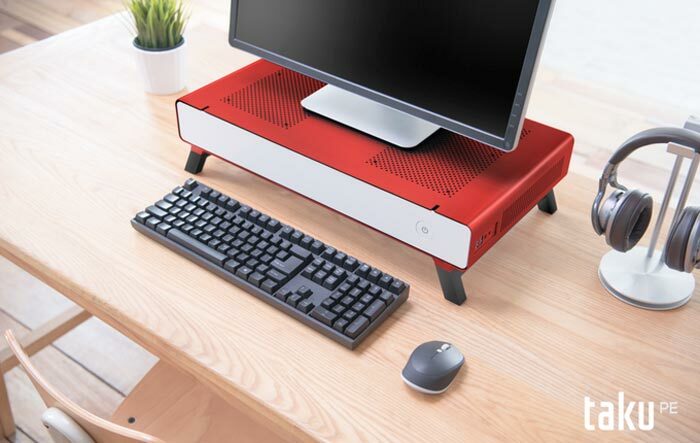 The design features four wood legs and the lozenge shaped aluminium body atop of the legs fits an ITX PC inside, in a drawer. Cryorig says it's been designing the Taku for approx two years with six months of co-development from Lian Li. Looking at the new Kickstarter page there appears to be several more body/legs colour/materials combinations available compared to last year. The drawer system allows easy access to build and reconfigure your Taku system. Though it's an ITX chassis Cryorig says that the Taku is still "fully capable of housing a high-end gaming system". Inside you can fit a dual-slot (40mm) GPU up to 280mm long, CPU fans up to 48mm tall, two 2.5-inch SSDs, one 3.5-inch HDD, memory modules up to 52mm tall, and an SFX power supply. One 92mm system fan comes pre-fitted. For convenience you can make use of the two cable management slots on each upper front side of the Taku. These let you thread through various USB cables you might need from day-to-day, a Micro-USB charging cable for your smartphone, for example. 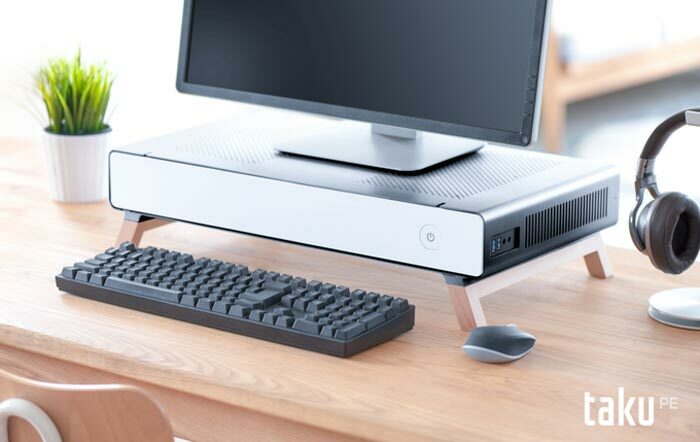 As a stand the Taku facilitates the support of monitors' up to 15Kg in weight. Furthermore, a full sized 104 key keyboard can slide under the chassis to clear desk space (max keyboard length of 460mm, height of 53mm). 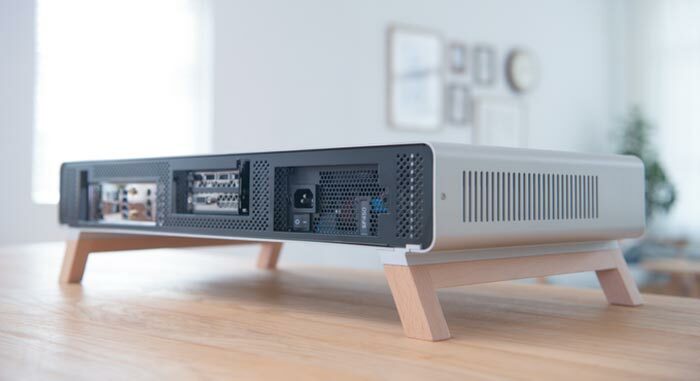 On Kickstarter the Cryorig Taku is currently available in its 'classic' livery of a silver chassis on light oak legs, for a pledge of $250. Other chassis/leg colour combos start at $299 and rise to $395. Pricing includes delivery to anywhere in the world and the estimated delivery time, should the campaign be successful, is September 2017. At the time of writing the Taku project has raised $3,891 of $100,000 with 59 days to go. If the project exceeds 1000 units Cryorig will provide all backers with a free C7 ITX CPU Cooler (USD$29.99 MSRP). Looks like it would have poor airflow. HDDs especially. Nice idea, think the airflow will be OK being raised off the ground and that much venting. A huge monitor stand could block things up a bit but I guess the wight limits stops anything too huge going on. Was tempted but about twice the price I'd be willing to pay. Looks nice enough, also I am not a huge fan of the colour scheme. I would also be reluctant to give up precious desk space for it, when a Fractal Design Define Nano S can simply be shoved under the desk. A computer that acts as a stand for a monitor? Now where have I seen that before…?